Flexible and affordable, Adam Equipment indicators are well-suited for use in warehouses, production lines, shipping and receiving departments, and during packaging, processing and inventory control jobs. From basic models to IP66-rated washdown versions, Adam's indicators deliver the durability and versatility needed to perform weighing and counting tasks. Adam Equipment indicators can be configured with a number of platforms, allowing users to combine the features, functions, readability and capacity to suit their needs. 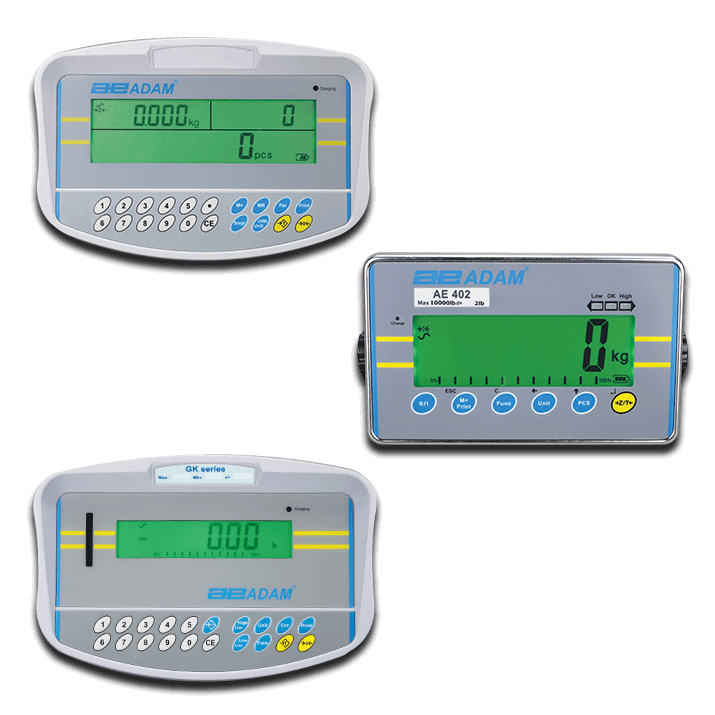 Adam indicators provide a wide range of features, including large displays, numeric keypads and colored LEDs to simplify weighing, checkweighing and counting tasks. AE402 is well-suited for food processing or shipping and receiving, with IP66-rated stainless steel housing that can be cleaned quickly. A large LCD is readily visible in any lighting conditions. With a wide range of features, the GC is ideal for parts counting tasks. Its numeric keypad facilitates unit weight and sample entry, while the display shows unit weight, total weight and number of pieces. The GK features a full numeric keypad, allowing users to preset tare values for repetitive weighing of identical containers. Coloured LEDs speed up checkweighing, indicating if the weight is over, under or within a specified range. Search our product range options by readability, capacity, or simply by name. The maximum weight that can be placed on the scale or balance. How well a scale displays the correct results. Readability is the value of the finest division of the scale. See our glossary page for more helpful definitions. Many business owners and managers dread the end of the year stock taking. It's been more than a year since the Safety of Life at Sea (SOLAS) amendment took effect.